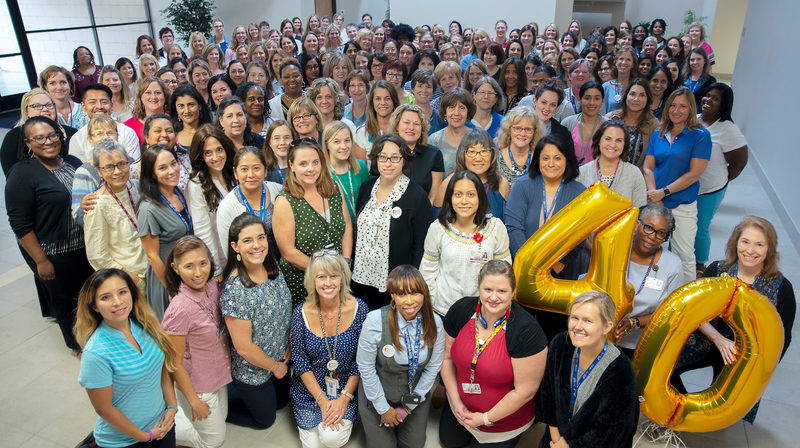 School-Based Therapy Services celebrates 40 years of service this year in greater Harris County. Harris County Department of Education’s occupational, physical and music therapists work with students and collaborate with educators to provide school-based solutions for students with special needs. HCDE School-Based Therapy Services provides 53 percent of special education therapy services provided to students in the 25 Harris County school districts. As the therapists met Aug. 21 for back-to-school planning, Carie Crabb, senior director, reflected on the role her therapists play helping students and teachers be successful in the school setting. “Our charge in special education is to provide therapies that are needed so that children can benefit from and make progress in their special education program,” she said. “We help students participate in their school settings alongside their non-disabled peers. With an average 10-year retention rate for therapists, Crabb thinks an excellent work environment coupled with management support and a flexible work schedule attracts therapists to HCDE and the school-based therapy career. HCDE therapists assisted 7,070 students in the 2017-2018 school year, along with 8,000 educators. Crabb says serving educators completes a big part of her division’s mission. Crabb believes there is a greater purpose in helping students with curricular and extracurricular tasks like taking a test or being able to be a part of the debate team or join the band or choir.